(SPOT.ph) Congratulations! You’ve finally found a date for your reunion that miraculously works for everyone in the group chat. Now comes the next hard part: Choosing a restaurant that’ll please even the pickiest eater in the squad. 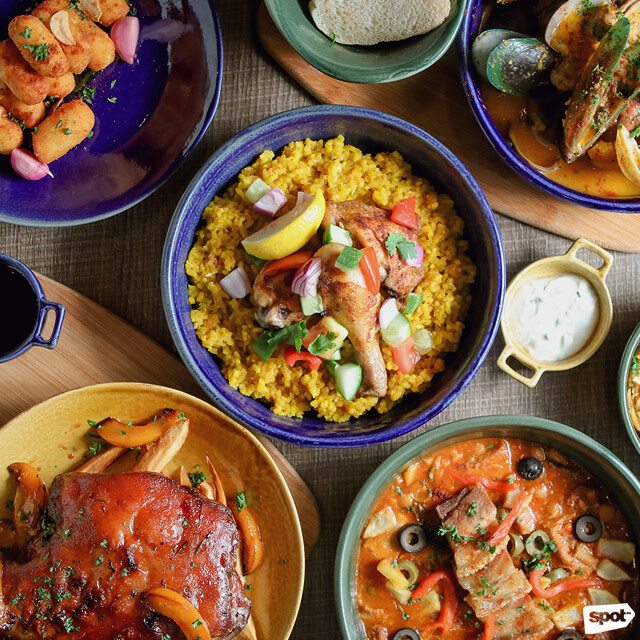 Fortunately, Metro Manila’s dining scene is ever-growing, which means you’ll never want for options. 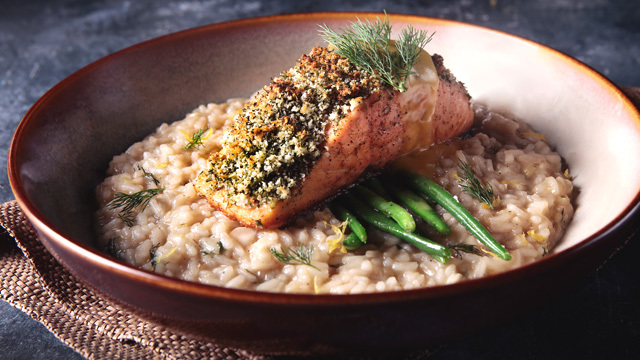 We’ve rounded up restaurants in the Metro that promise tasty grub in servings that’ll feed the entire group—and still leave enough for seconds. 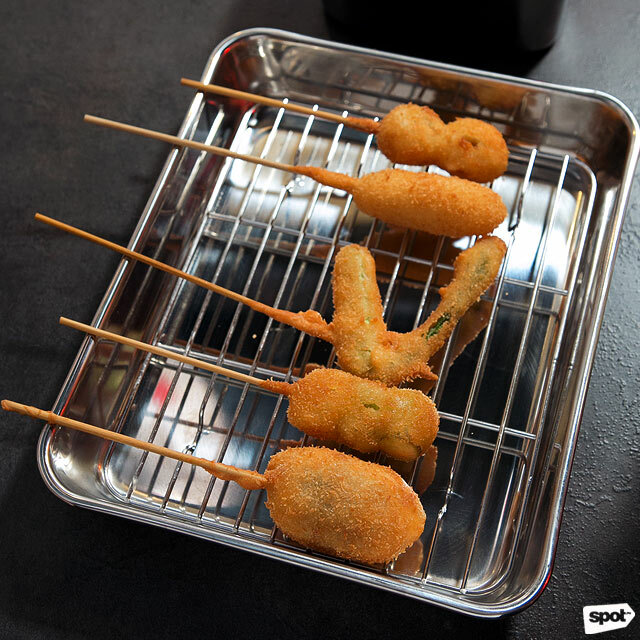 Fried food will always be a crowd-pleaser, and Kushikatsu Daruma has a varied selection of kushikatsu or fried morsels-on-sticks to please everyone in your group. 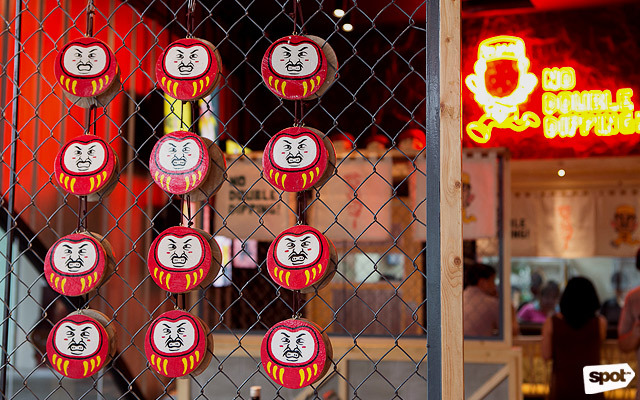 Your Instagram-savvy friends will also have a field day snapping photos of this Japanese resto’s fun and quirky décor. Pair your kushikatsu with a bucket or two of ice-cold beer and don’t worry about having to head home while the night’s still young because Kushikatsu Daruma is open until 3 a.m.
Kushikatsu Daruma is at 2/F Uptown Mall, Uptown Bonifacio. If you have a large clan, have your next family reunion at Buca di Beppo. Their pasta and pizza servings in Large are big enough to satisfy a group of 10 to 15 people, and still leave enough for seconds. 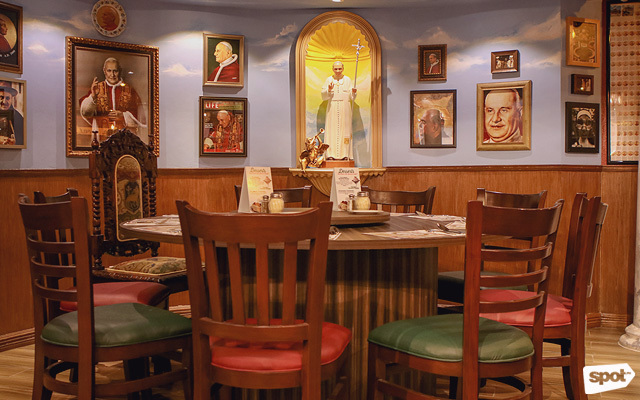 Plus, Buca di Beppo’s delightfully kitschy interiors will make for memorable photos—if your family has a cheeky sense of humor, they’ll love the Pope Room. 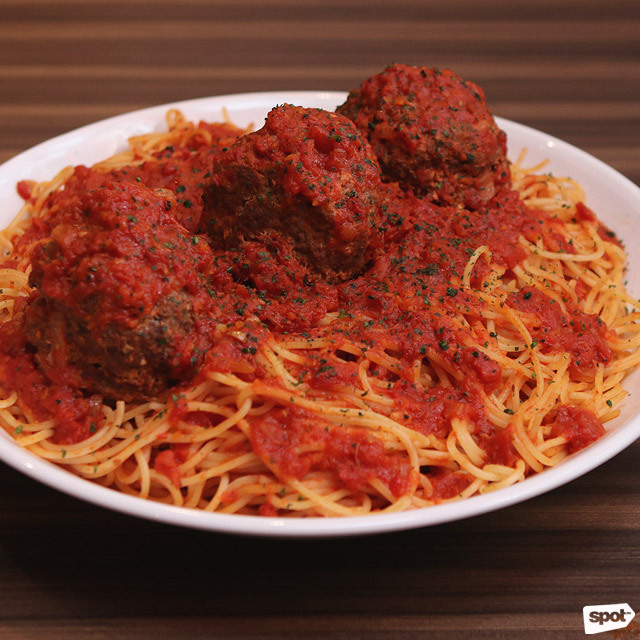 Buca di Beppo is at G/F BGC Corporate Center, 11th Avenue corner 30th Street, Bonifacio Global City. 8 Cuts Greenbelt reopened in October 2017 at a bigger two-storey building, with an al-fresco area that’s gorgeously lit at night, and a full bar stocked with beer on tap from Engkanto Brewery. 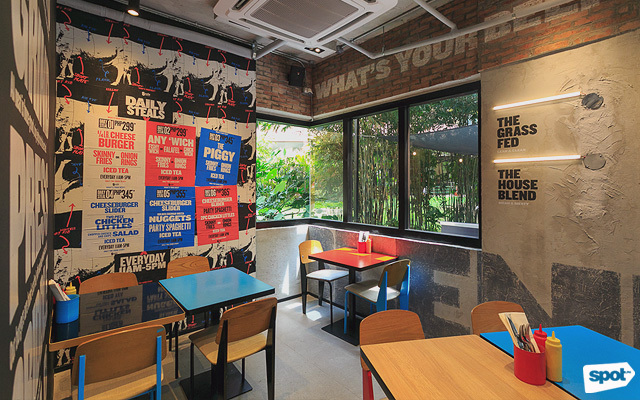 Aside from their signature burgers, they’ve also introduced a menu exclusive to the branch that’s perfect for large groups. The shareable Buffalo Wings now come in two new flavors—Them Buffalo Wings and Garlic Parm Wings—only available at Greenbelt. 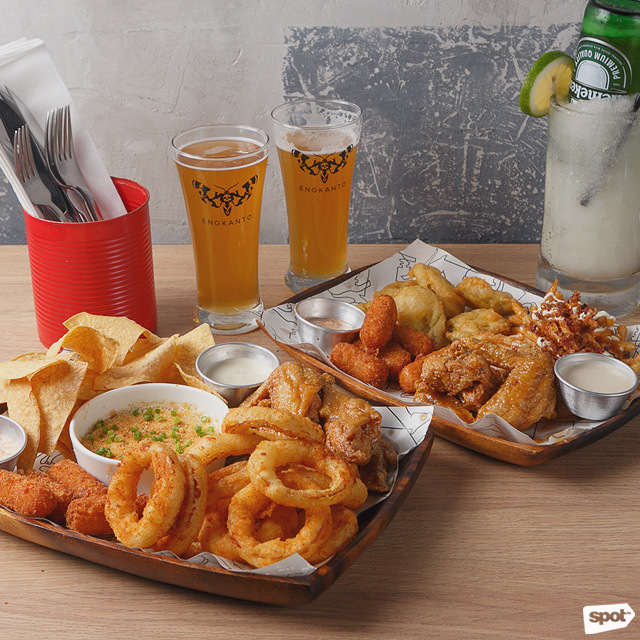 No one has to feel left out, too, with The Platters, which has all your favorite 8 Cuts sides, like onion rings, fries, Mozza Nuggets, Buffalo wings, and The Double Dipper, in one heaping tray. 8 Cuts Greenbelt is at Greenbelt 2, Ayala Center, Makati City. 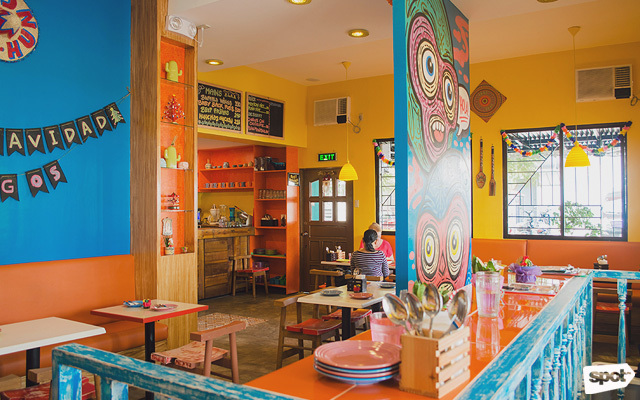 Marikina is a treasure trove of underrated restaurants, like this vibrant eatery on Lilac Street. Hunchos’ menu is inspired by Mexican parties, so expect festive fare in shareable portions. While they serve Mexican favorites like the Cheese Pork Quesadillas, filled to the brim with gooey cheese and tender pork, don’t miss their more out-of-the-box dishes. 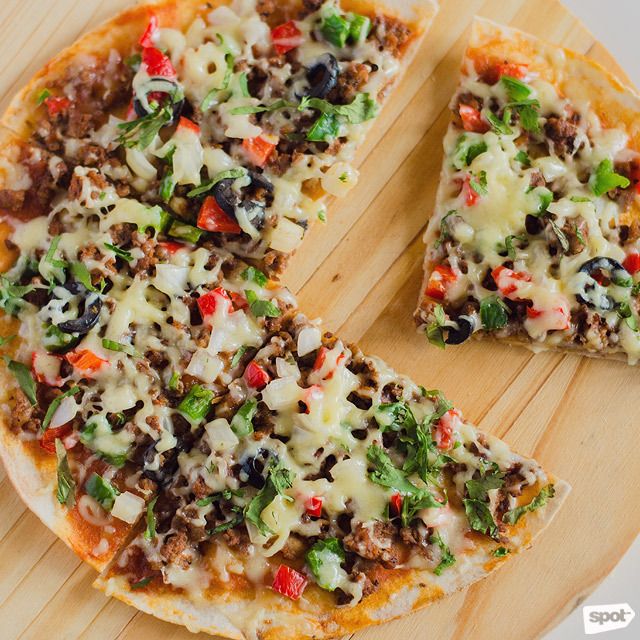 The Tortizza is a twist on your usual pizza, with a lightly toasted tortilla instead of pizza dough that’s topped with marinara sauce, melted cheese, and salsa. Hunchos is at 18 Lilac Street corner Appaloosa Street, Rancho 4 West, Concepcion Dos, Marikina City. Taking your favorite tita friends out for lunch? 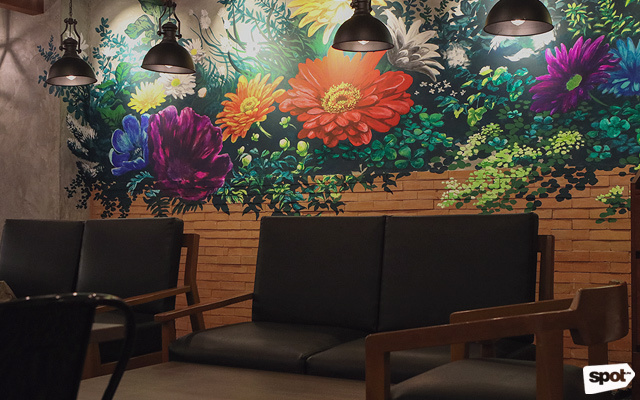 Café Enye’s new BGC branch is the perfect option; for sure, they won’t be able to resist the stunning floral mural by artist Akane Watanabe. Chef Claudia Schulze whips up Spanish dishes with a twist, like the flavor-rich Moroccan-Style Curry Paella, which uses a much headier spice blend of curry-turmeric and cinnamon. The Cochinillo a la Casa is also a great alternative to your usual lechon belly: The cochinillo skin is beautifully crisp with just the right amount of fat underneath, and the pork itself is seasoned to be flavorful and succulent. Just resist the tita urge to ask them where they got their vibrant plates. Café Enye is at Mezzanine Floor, Citi Plaza 34th Street, Bonifacio Global City. Anyone who’s watched enough K-Dramas knows that Korean barbecue is meant to be enjoyed with great company. 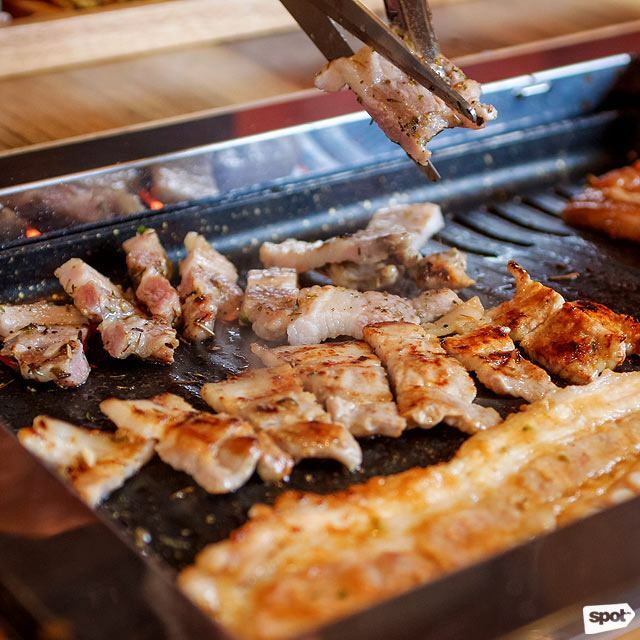 Jin Joo lets you take charge of your meal, from grilling your own pork belly to melting the mozzarella and Parmesan blend of the Cheese Dung Galbi yourself. Gather the crew and have Jin Joo’s signature 8 Flavors. With flavors that range from the traditional Red Pepper to the more off-beat Curry and Wine, this samgyupsal platter is sure to have something for everyone. 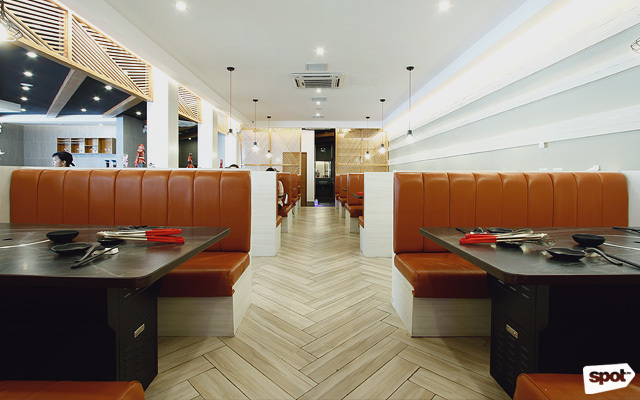 Jin Joo Korean Grill is at 5/F SM Aura Premier, C5 Road corner 26th Street, Bonifacio Global City. Rackshack is RACKS’ more laid-back younger sibling, where you can stuff yourself on ribs, brisket, and more to your heart’s content. 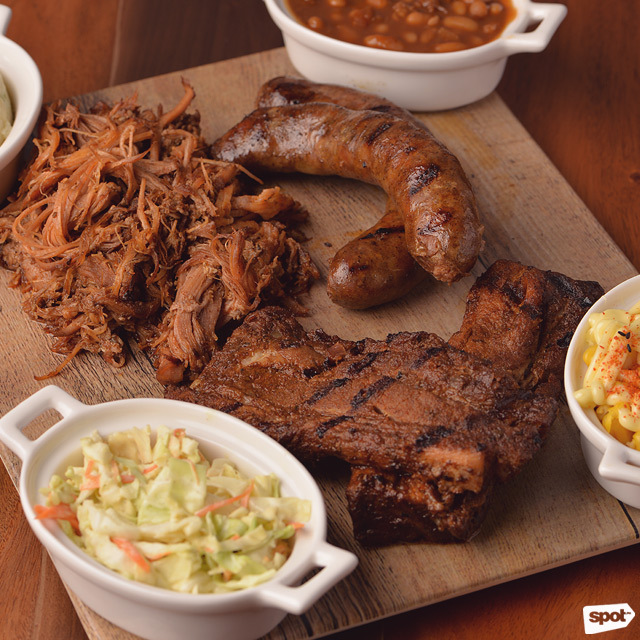 The Groupie Platter will get you peppery hot links (or American-style sausages), pulled pork, and fork-tender ribs. Challenge your friends to games like Cards Against Humanity or What Do You Meme while devouring your stack of Ridiculous Nachos with nachos, onion rings, pulled pork, or have a fun game of beer pong at Rackshack’s al-fresco area. Plus, the bright, cheery décor guarantees you’ll have lots of great selfies to remember the night with. 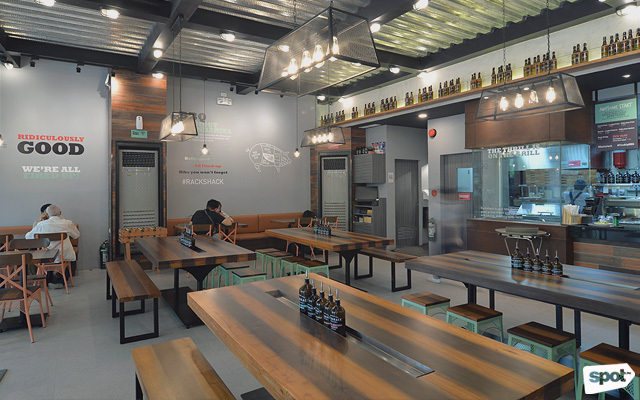 Rackshack is at 5/F SM Aura Premier, Bonifacio Global City. Even the pickiest eater won’t be able to resist pizza and pasta, and Mamma Mia has these plus much more. 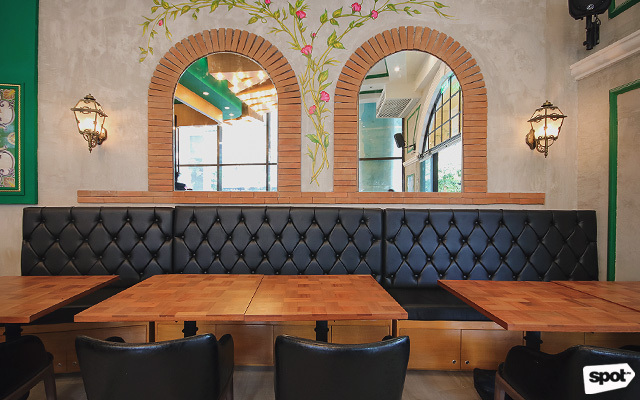 Owner Giulius Iapino envisions the food at Mamma Mia to be reminiscent of what your mom would serve your friends when they drop by for a meal, so expect hefty servings. Spice up your conversations with a tasty starter, like the Melon and Pumpkin Wrapped With Prosciutto Al Forno, served with a tangy yogurt dip. 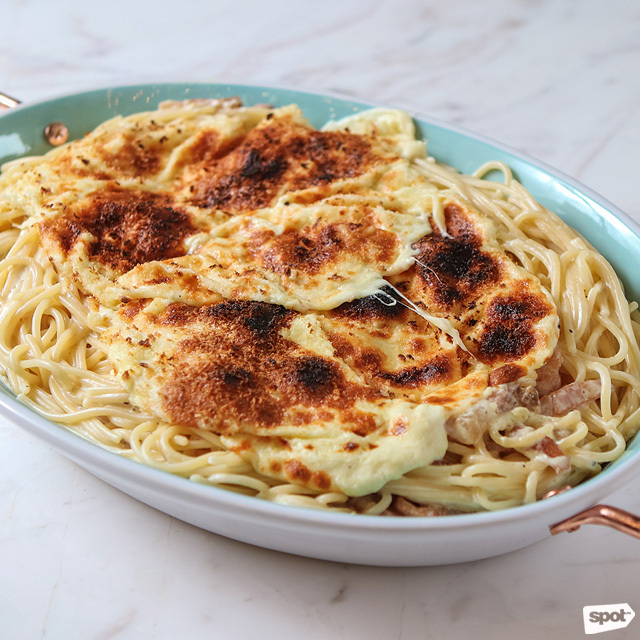 If you and your friends can’t get enough of cheese, order the Spaghetti Carbonara Alla Mamma Mia, topped with a layer of gooey melted Parmesan cheese. You also won’t be disappointed with their pizzas, with a crust that’s stuffed with a rich and creamy blend of Taleggio, Mozzarella, Cream Cheese, and Mascarpone. Mamma Mia is at G/F Uptown Mall, Uptown Bonifacio. DIY barbecue restaurants are always a hit with large groups. After all, it’s a lot of fun to grill your own meat, especially with friends. Korean barbecue may have been all the rage in 2017, but for something a little different, try yakiniku or Japanese barbecue at Mitasu Charcoal Yakiniku. 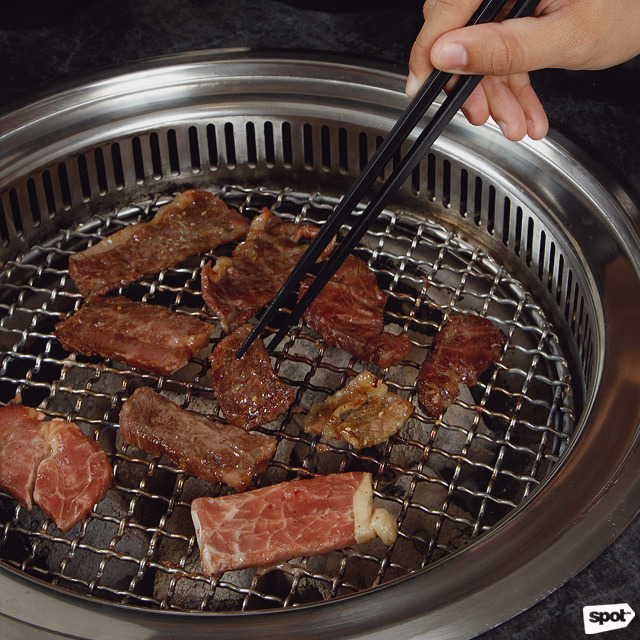 Unlike Korean barbecue, Japanese barbecue is grilled unmarinated and served with a sweet-spicy yakiniku dipping sauce. 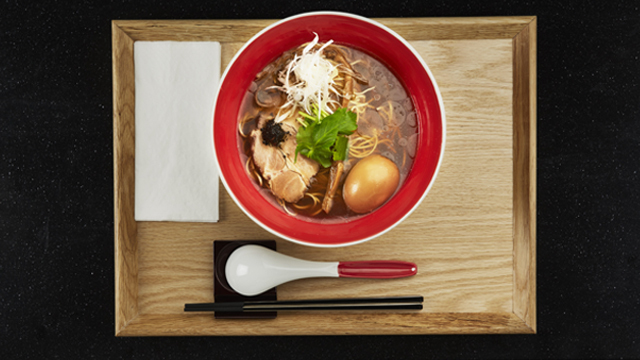 At Mitasu, they use charcoal grills, which give your grilled protein a subtle smoky flavor. The Premium Assorted BBQ Set is a real treat, with different cuts of beef like hanging tender, Australian Wagyu striploin, and Australian Wagyu cube roll, plus Japanese rice, miso soup, and lettuce to wrap your beef in. Mitasu Charcoal Yakiniku is at 785 Banawe Street, Quezon City. 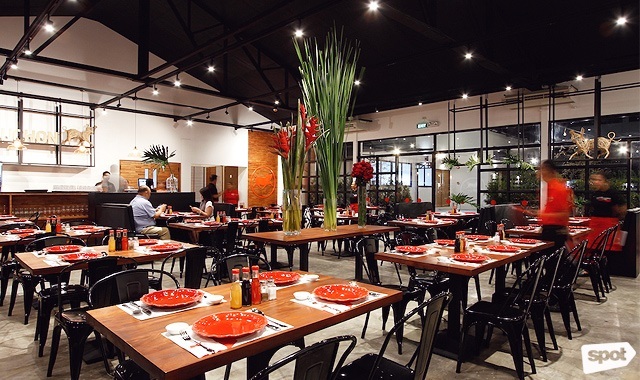 Aside from their first Luzon branch in Makati City, this Cebu-based lechon house just opened a branch at SM Megamall last October 2017, making it easier to feast on their Cebu-style roast pig after a round or two of Christmas shopping. 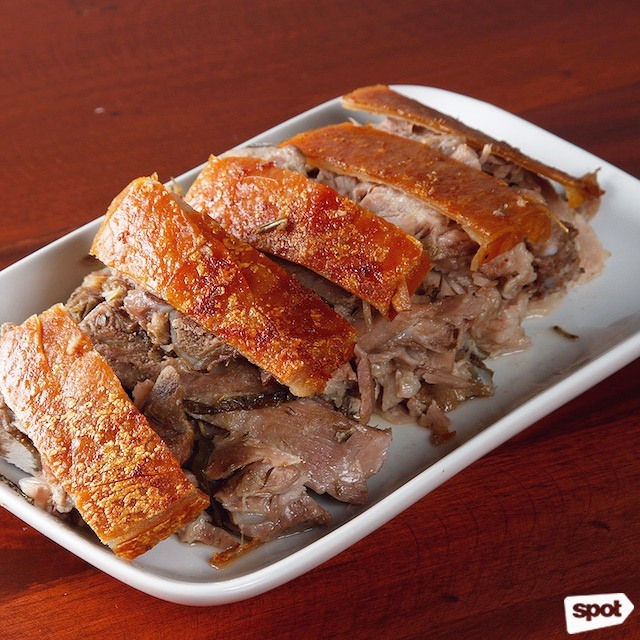 Their Boneless Lechon, which holds all the mouthwatering goodness from Zubuchon’s blend of 15 herbs and spices, is available in Medium and Large sizes, both huge enough to share. 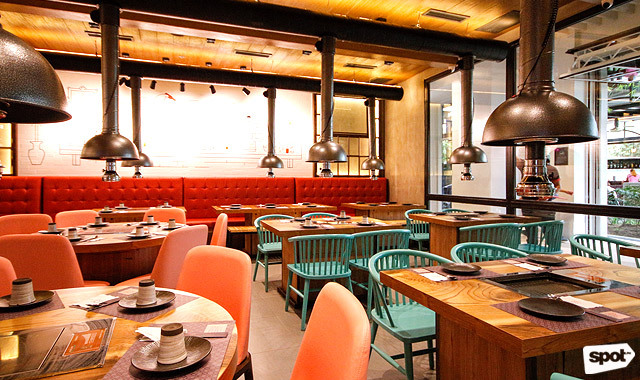 Throw in some of Zubuchon’s home-style dishes like the Zubuchon Pancit, topped with crispy lechon skin, the Gambas, or the Daing Rice, for a hearty feast. 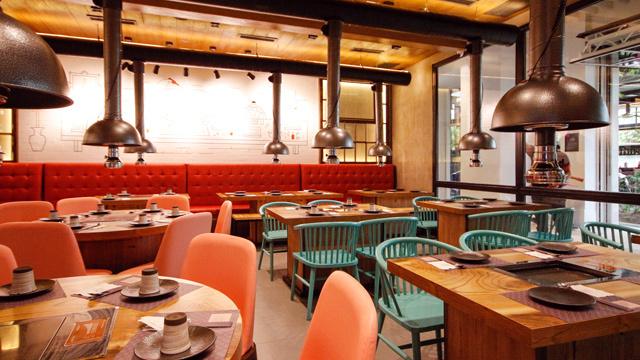 Zubuchon is at Talisay Street, Barangay San Antonio, Makati City; and UG/F Building A, SM Megamall, Mandaluyong City.